This article has been updated since its original posting on June 20, 2018. 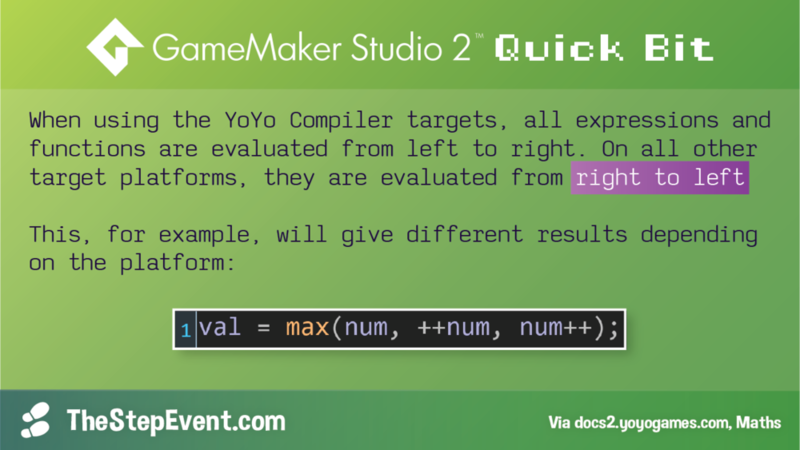 Did you know you can prompt a user to send a pre-written Tweet from YoYo Games’ GameMaker in just a single line of code? How about this: numbers are less-precise on the HTML5 target when compared to the Windows target. Or that the YoYo Compiler target evaluates expressions and functions backwards?! This article is chock full of information about those facts and more. 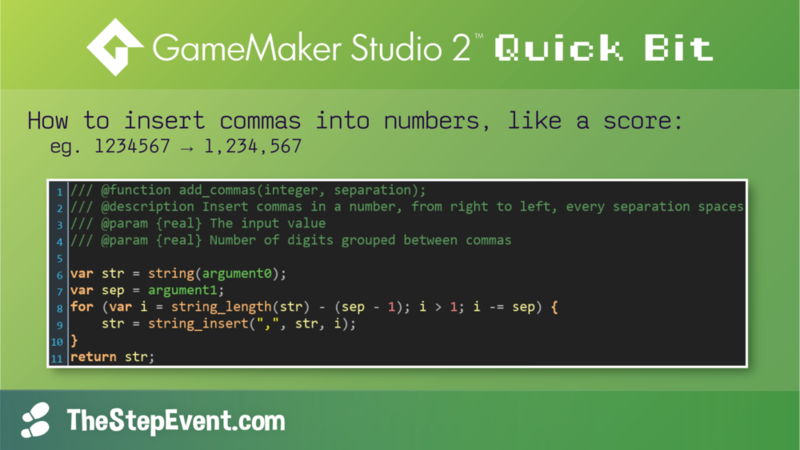 Welcome to a curated list of 20 “Quick Bits”, GameMaker Studio 2 tips, tricks, and code snippets that come from my Step Event Twitter account. Whether you’re seasoned with the software or just getting started on your game making journey, chances are you’ll learn something new. 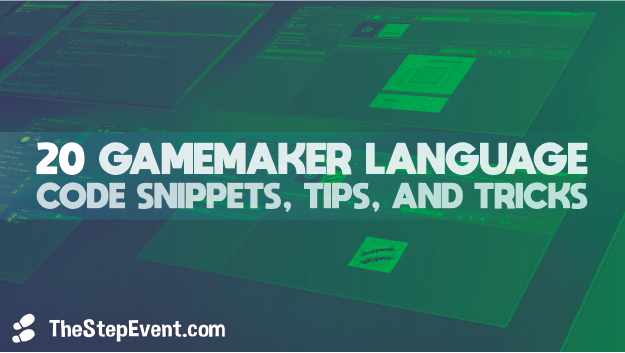 The instance-creating functions — instance_create_layer and instance_create_depth — are among the first functions that many new GameMaker Studio 2 developers will learn how to use. The importance of adding copies of specified objects into the game world goes without stating. But, there’s more to these backbone functions than what novice game makers may realize. instance_create_layer and instance_create_depth functions return the id of the newly-created instance. You can store this value in a variable so the particular instance can be addressed. Macros and Enums don't need to be called to be initialized. An uncalled script, which houses your Macros and Enums, is enough for them to be loaded into your game. Time saver: middle-click a resource reference or function in the Code Editor. GMS2 will open the respective resource or Help Doc entry. GMS2 supports ternary operators, an elegant approach to conditional expressions. 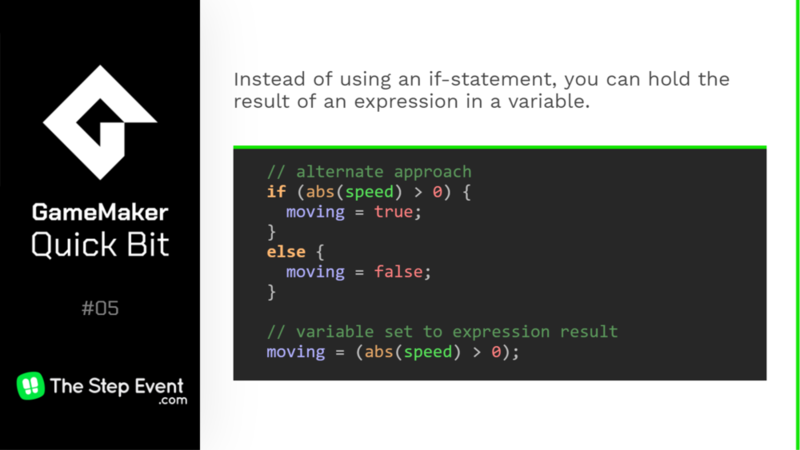 Instead of using an if-statement, you can hold the result of an expression in a variable. 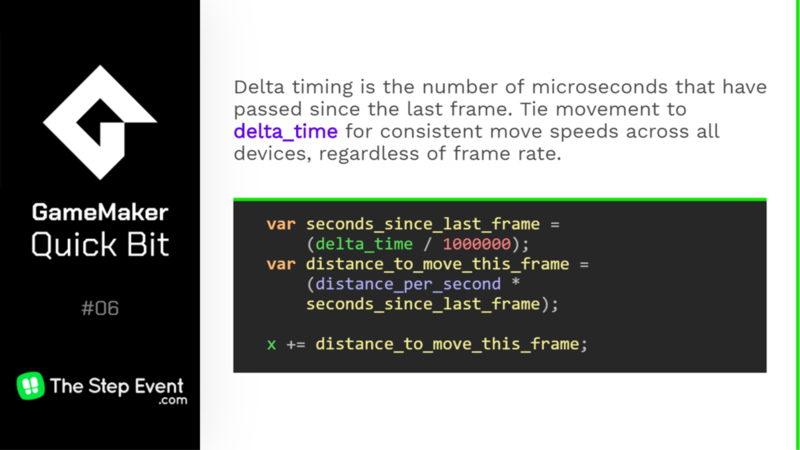 Delta timing is the number of microseconds that have passed since the last frame. Tie movement to delta_time for consistent move speeds across all devices, regardless of frame rate. Instead of using if-statements to limit the value of a variable, you can use clamp. Make stuff - like text and sprites - flash every [rate] seconds using this blink script. Supply values for "on" and "off" states, and optionally define the rate, which will default to 1 second. Get in the habit of writing clean code by customizing your documentation experience! In Preferences → Objects, you can setup a template that all Scripts and Events will default to. Twitter makes sending tweets from your game a breeze! Don't forget to encode the URL first! Logical inverses make for easy toggles. In the example below, variable soundEnabled switches between true and false each time the S key is pressed. Code formatting getting messy? Copy-paste yoru GML into a code beautifier. Making a camera that resembles the one found in Vlambeer's Nuclear Throne. This code snippet centers the camera, cam, between the player object, obj_player, and the cursor. Re-map a number, arg0, from one range (arg1,2) to another (arg3,4). 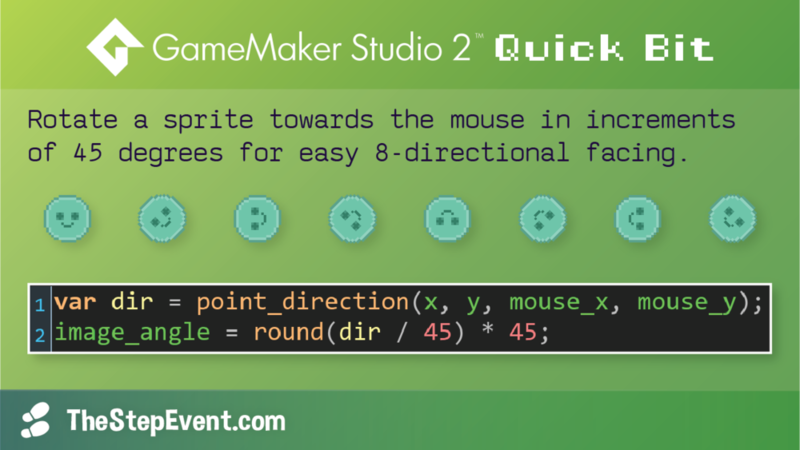 Rotate a sprite towards the mouse in increments of 45 degrees for easy 8-directional facing. Leftover from Delphi, GameMaker stores colors in "little endian" format. Because of this, GMS2 colors are assigned $BBGGRR instead of hex #RRGGBB. Heads up! 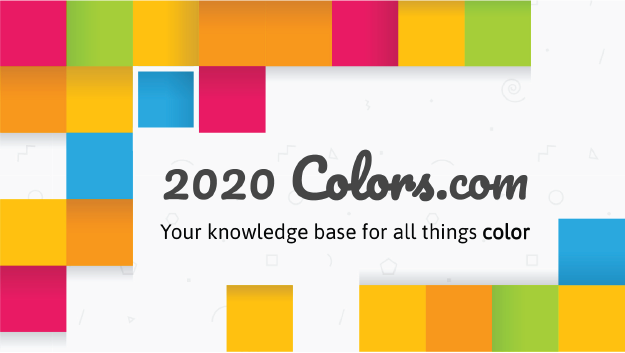 A website I developed, 2020 Colors, converts any color to a $BBGGRR format so you can easily use “hex” colors in GameMaker. 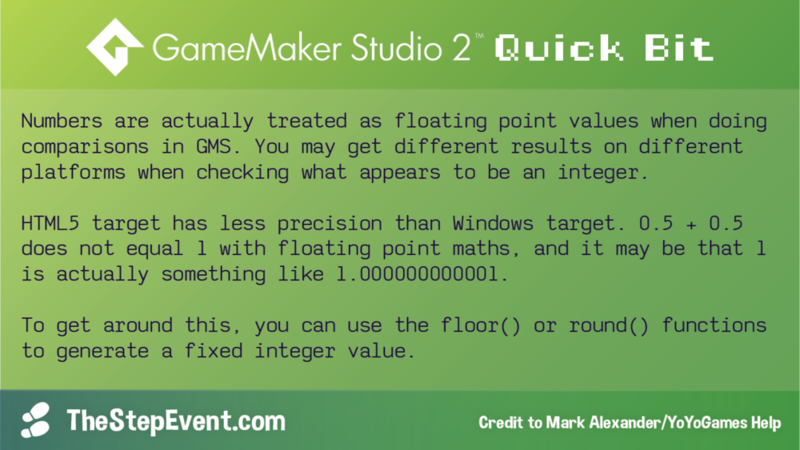 Numbers are actually treated as floating point values when doing comparisons in GMS. You may get different results on different platforms when checking what apepars to be an integer. HTML5 target has less precision than Windows target. 0.5 + 0.5 does not equal 1 with floating point maths, and it may be that 1 is actually something like 1.000000000001. To get around this, you can use the floor() or round() functions to generate a fixed integer value. When using the YoYo Compiler targets, all expressions and functions are evaluated from left to right. On all other target platforms, they are evaluated from right to left. How do I post a tweet to Twitter using GameMaker? You can post a tweet using a simple url_open_ext function call and Twitter’s intent API. Refer back to #11 for the code snippet. What are floating point numbers and why should I be concerned with precision? Why doesn’t GameMaker use standard red, green, blue hex values? This is left-over from the programming language that GameMaker was originally written in, Delphi! How do I add commas to my numbers? Formatting your numbers, like currency, is as easy as casting integers to a string and adding a comma character every third space, starting from the end. What can I do to stop my game from lagging? As #6 demonstrated, you can use the delta timing functionality to help combat lag in your game. If you're feeling like sharing your newfound knowledge, pass this post along to a friend. Follow The Step Event on Twitter for more Quick Bits. Know something that would make a great Quick Bit? Let me know and you’ll be credited!